In the fall of 2003 I decided I should make more 'commercially viable' photographs so I could sell more prints. The results were mostly mediocre. I see it as a period where I failed to be true to myself, but it's a little more nuanced than that. It was fall, so I decided to photograph fall colours in the mountain parks - because that was something serious nature photographers did. Here's a couple of the better ones. Ironically, looking at these photographs now, I find myself liking them better than I did at the time. The compositions are simple and striking - especially at 'thumbnail size'. The fall colours are beautiful. Let's compare these to a couple of photographs taken earlier in 2003 (January and March). They are all photographs of aspens and they all have structured compositions. In the fall photographs everything falls on the same plane, while the winter photographs have depth. Partly, this is because the fall photographs were made with a telephoto lens and the winter ones with a wide angle lens. In the fall, I was deliberately choosing to use telephoto lenses because I felt this was something 'serious' photographers did. I wanted to become skilled at making intimate landscapes. But there's more to it than just lens choice. The fall photographs are very much about the thing being photographed. They are more portrait than landscape. But unlike a good portrait they seem to lack emotional engagement. Indeed, they were photographed at the side of the road while I was driving along 'seeking' compositions. 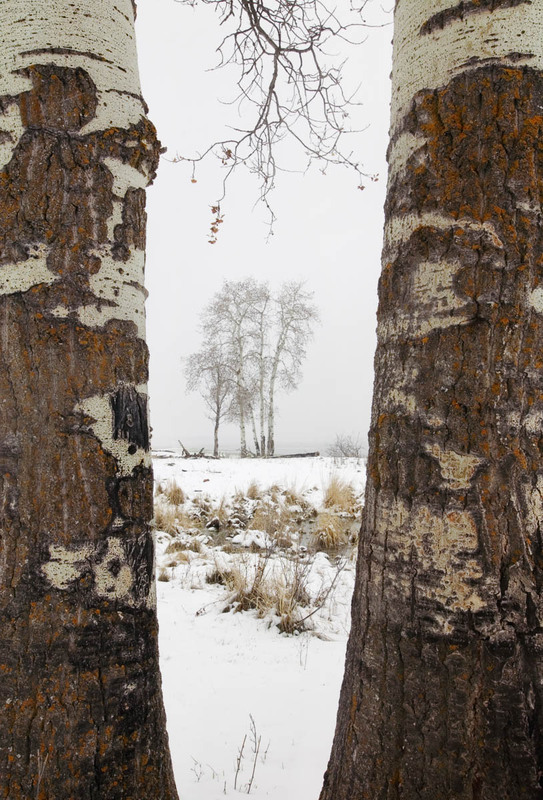 By comparison, the winter photographs are as much about the space as the things in them. I am literally immersed. I'm wandering on foot well away from the road and responding to my environment rather than mechanically seeking compositions. 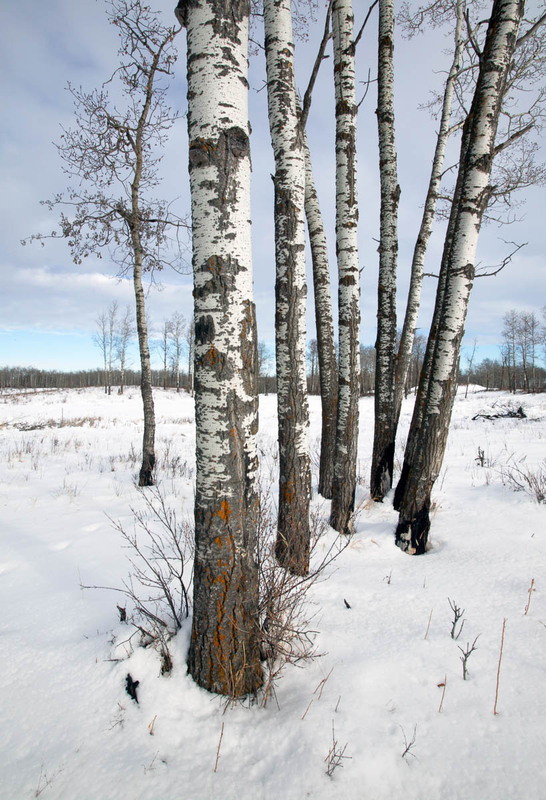 Both of the winter photographs were taken in Elk Island National Park, in an area I visited many times. It's off the beaten path. A special place place I had to myself. I think my strong emotional attachment comes through in the photographs. Its not that the choices made in the fall photographs are inherently wrong or poorer. They just reflect choices that are less true to me. I prefer photographs containing objects in multiple planes parallel to the viewer over photographs where the subject matter is primarily in a single plane. Similarly, I prefer the quiet solitude of winter to the vibrant colour of fall. Winter's snow covered landscapes with stark branches devoid of leaves have a simplicity and elegance that reminds me of calligraphy. The first four months of 2004 read like a searching process with plenty of experimentation. I'm reminded there's a delicate balance between being true to yourself and becoming set in your ways. In my mind I remember the period from fall of 2003 to the spring of 2004 as wandering around in a photographic desert brought on by overthinking the process. But looking back, I see it wasn't that simple. In part, I was trying different things, which informed future experiences even if they weren't entirely successful on their own. It was also a reflection of my limitations. Although I didn't realize it at the time, I had many things to learn about seeing the world. So, it was probably also a necessary part of the learning process. And finally, there's luck. There are stretches where I seem to see photographs everywhere and others that are simply less productive. I've been more sure of my photographic sense of self since then, but it's not a static thing - it keeps evolving and changing. There are times when I'm searching. But now I'm more likely to let it come to me rather than trying to make other people's photographs. Eventually, in late spring of 2004, the wandering ended with the start of what would become an intense explosion of activity resulting in the Prairie Waters series of photographs. An explosion of forms leading to the Prairie Waters explosion.